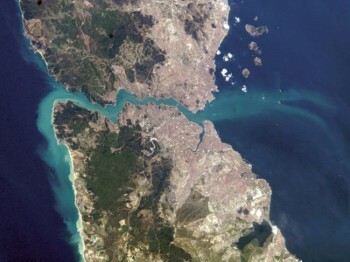 An image captured by the International Space Station shows the Bosporus Strait, which divides Istanbul, Turkey. Below a depth of about 150 meters, the Black Sea is devoid of oxygen. Only certain microbes can survive in this "dead zone," which reaches depths of over 2000 meters. Warm, salty water flowing from the Mediterranean Sea into the Black Sea ventilates the middepth water column of the sea, trapping anoxic water below and maintaining the sea's distinctive structure. However, the precise fate of inflowing Mediterranean waters has remained something of a mystery to scientists. In a new study, Falina et al. present the first sea-wide overview of the behavior of Mediterranean waters in the Black Sea. They track the path of the newly arrived water and investigate what happens when strong winds impact incoming flow. Mediterranean water flows into the Black Sea through its single connection: the Bosporus Strait. Previous research has shown that more water exits the Black Sea at the strait than enters. The Mediterranean water that does inflow mixes with fresher Black Sea water, and as its salinity and density decreases, the Mediterranean water forms plume-shaped features. These plumes flow away from the mouth of the strait and descend until their density matches that of surrounding waters, usually at depths of 100 to 600 meters. 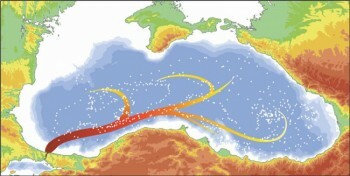 To track the size and location of these Mediterranean plumes throughout the Black Sea, the authors relied on the tendency of the plumes to stay warmer than surrounding waters. The researchers compiled temperature, depth, and salinity data collected from aboard three ships as well as by a network of autonomous instruments known as Argo floats. The entire data set covered 657 locations from 2005 to 2009. The data revealed that after strong storms over the Bosporus Strait, Mediterranean plumes propagate throughout the main part of the sea, covering much more area than previously thought. The Rim Current, which transports upper and middepth waters counterclockwise around the entire Black Sea, carries the plumes along, delivering them after several months to interior gyres in the eastern and western parts of the sea. During these strong storms, powerful winds are known to thrust water in the strait northward, dramatically increasing the amount of Mediterranean water entering the Black Sea. The scientists hypothesize that this results in the formation of abnormally large, warm plumes that propagate throughout the sea. Mixing makes the plumes undetectable in less than a year. Citation: Stanley, S. (2017), Big storms pump Mediterranean water far into the Black Sea, Eos, 98, https://doi.org/10.1029/2017EO071161. Published on 11 April 2017. Поздравляем А.С. Фалину и А.А. Сарафанова с успехом! Результаты исследования изложены в статье «Observed basin-wide propagation of Mediterranean water in the Black Sea», опубликованной в журнале Journal of Geophysical Research: Oceans. Статья доступна для бесплатного просмотра и скачивания.